Embark on an incredible adventure that offers the unimaginable beauty of Alaska’s vast and remote wilderness. Designed for the adventurer who seeks the ultimate Alaskan river experience. 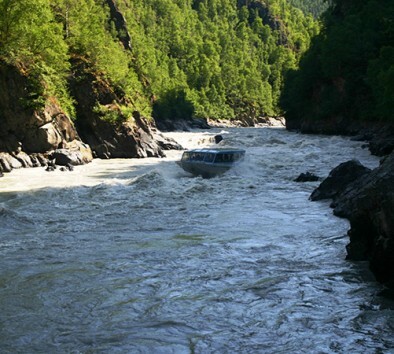 Traveling in an enclosed jet boat, you will travel 130 miles on the Susitna River, taking you through Denali State Park and into the nationally recognized Devil’s Canyon Gorge, where you will enter into Class V whitewater. This is the best way to experience whitewater in a safe dry and comfortable environment. Travel into the remote wilderness and keep your eyes open for wildlife that call this area home. Next, stop ashore and visit an authentic trapper’s cabin and a recreated village of the Dena’ina Indians—the area’s original inhabitants. Your naturalists will acquaint you with the wildflowers and plants that grow in abundance along the river system and you will learn about the edible plants that were used by the Native Indians for cooking and medicines. Wear comfortable walking shoes. Dress in warm layers. Bring a camera. Wildlife sightings are likely but not guaranteed. Tour will operate rain or shine. Tour operates subject to meeting a minimum number of participants. Tour takes place in Talkeetna.